Everybody is playing Angry Birds. 1 million downloads on one day (October 15th) and over 30 million downloads combined on iPhone and android. The game is simple, almost stupid but very addictive. I see people playing in smoke breaks, on trains, in break rooms. I even heard one guy playing it in the restroom. 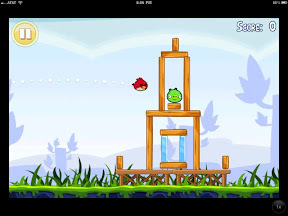 Angry birds lite is free, full version is $1.99 and the iPad version even $4.99. They have even Halloween and Christmas version of it. You can even by cheat apps for angry birds. Angry birds is an example how successful a simple game can be.make it easy, make it fun and it will rock. I had it as well but I deleted it as soon i did read the WSJ article. In a report published by the Wall Street Journal on 12/17/2010, reporters found that Angry Birds for the iPhone and Android phones may be sending your private data such as contacts, your phone's unique ID number and even your phone number to third party marketing and advertising firms. The report encompassed 101 of the most popular apps and games on both platforms and, more specifically, found that Rovio, the developer of Angry Birds, knows your phone's unique ID number, contacts and location thanks to you playing the game. Worse off, WSJ suspects that the company is sending that information to third parties. In a reaction statement made by the developer, Rovio denied all allegations that it is sending this information to anyone other than Crystal, the social network that supports its games, and uses Flurry, an analytical software. "Crystal does not store any personal information, as insinuated by the WSJ article, nor does it utilize any data without the user's explicit knowledge," a Rovio spokesperson told gaming news site Develop. "Flurry collects analytical data to display numerical data such as numbers of users per different countries based on Phone ID and general location. This information is only displayed as aggregate statistics - Flurry never stores or displays any data pertaining to an individual." And don't think these are the only games and apps that could be making some coin off your private information. The chart and infographic go on to mention that Doodle Jump, Ninjump, Paper Toss, Foursquare and even Tweet Deck are having their way with a least a sliver of your personal data. While the report does point a few fingers, its true purpose is to raise awareness to the fact that our personal data may not be safe even on our smartphones. Angry birds is not the only app which collects your data, WSJ reports that most of the popular apps are trying to make some extra money by collecting your data.